The TTRT-03 is Amperis’ second generation, microprocessor-based, automatic, three phase, and transformer turns-ratio tester. This lightweight, portable unit is designed for testing transformers at utility power substations. The TTRT-03 determines the transformer turns-ratio using the IEEE C57.12.90 measurement method. The transformer turns-ratio (ranging from 0.8 to 15,000) is determined by precisely measuring the voltages across the unloaded transformer windings. To ensure accuracy, the TTRT-03’s measuring circuitry self-calibrates before each measurement. It requires neither adjustment nor temperature compensation. The TTRT-03’s turns-ratio measurement accuracy is 0.1% or better. The TTRT-03 can perform a specific test for each transformer type (such as single phase, delta to Y, Y to delta, delta to delta, or Y to Y) without the need to switch test hookup cables. Also, the unit’s automatic transformer phase detection feature can detect different transformer vector diagrams. The TTRT-03 can automatically detect and test 67 transformer types defined by ANSI, CEI/IEC and Australian standards. To prevent an accidental wrong test-lead hook-up (e.g., when the operator reverses H and X leads), the TTRT-03 outputs a low-level test voltage to verify the hook-up condition before applying the full test voltage to the transformer. In addition to measuring a transformer’s turns-ratio, the TTRT-03 can also measure a transformer’s excitation current (in milli-amperes) and its winding phase angle. Three test voltages (8 Vac, 40 Vac, 100 Vac) allow the TTRT-03 to test CT’s and PT’s, as well as power transformers. The TTRT-03 can also calculate the turns-ratio percentage error if the transformer’s nameplate voltages are provided. The baseline turns-ratio is calculated using the nameplate voltages, and the test results are compared to the baseline turns-ratio. The percentage error is then calculated from the difference between the baseline and test turns-ratios. The TTRT-03 features a back-lit LCD screen (20 characters by 4 lines) that is viewable in both bright sunlight and low-light levels. 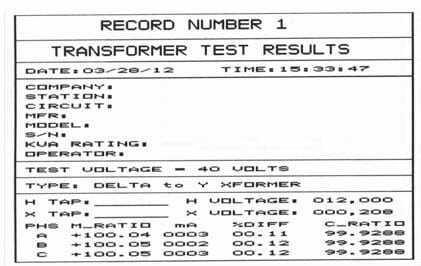 The test results screen displays the transformer turns ratio, excitation current, and turns-ratio accuracy. The unit is controlled via a rugged, 16-key, membrane keypad. The TTRT-03 can be computer-controlled via the RS-232C interface using the supplied PC software. The Windows®-based software can be used to run a test and to store test results on a PC. Test results can also be exported to Excel, PDF, and XML formats for further analysis. 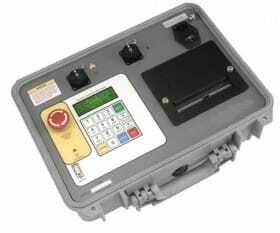 Voltage regulator or LTC tap positions can be changed remotely using the optional Tap-Changer Remote Control Box. This option eliminates the need to manually raise or lower tap positions from the transformer control panel. The TTRT-03 features a convenient built-in 4.5-inch wide thermal printer that can be used to print test results. Up to 200 test records can be stored in the TTRT-03’s Flash EEPROM memory. Each test record may contain up to 99 turns-ratio, excitation current, phase angle, and nameplate voltage readings. Test records can be recalled locally or transferred to a PC via the RS-232C interface. The TTRT-03 can store up to 128 transformer test-plans in its Flash EEPROM. A test plan is comprised of the transformer nameplate voltages for each tap setting. The calculated turnsratio based on the nameplate voltages is compared with the measured turns-ratio to derive the percentage error and Pass/Fail results. By using a test plan, a transformer can be quickly tested and turns-ratio Pass/Fail reports can be reviewed. Test plans can be created with the included PC software and can be transferred to the TTRT-03 via the RS-232C interface.